A police officer directs MPs where to go as they arrived for interrogation at Kibuli police headquarters. Photo by Raymond Mayanja. NRM MPs have expressed mixed reactions regarding Speaker Rebecca Kadaga’s decision to invoke the rules of procedure that led to the suspension of 25 MPs and subsequent raid of the House yesterday afternoon by security personnel. The nation was treated to unprecedented scenes of violence and brute force in the House as security personnel beat up and dragged Opposition MPs out of the chamber. Speaker Kadaga had earlier read out the names of 25 MPs marked for suspension and asked them to leave the House. When the MPs refused to budge, the security operatives burst into the chamber and chaos ensued. The Opposition has termed the raid as an assault on the sanctity of Parliament with the Leader of Opposition, Winnie Kiiza, describing it as a takeover of Parliament by President Museveni. However, Kassanda North MP Simeo Nsubuga says the Speaker acted within the rules of procedure that govern Parliament. “That is the discretion of the Sspeaker. I am not a Speaker. I am a mere MP but you have to obey the Speaker,” he opined. A senior official in the NRM caucus who preferred anonymity said the Speaker was pushed into a corner and was left with no choice but to act. 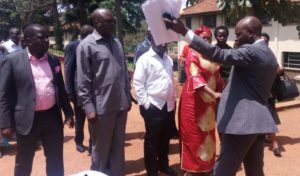 However, several NRM MPs have offered reservations at the way the chamber was raided. 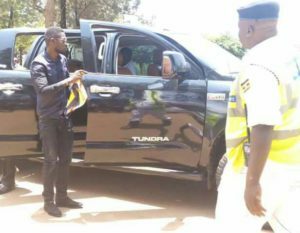 Bobi Wine arrives at Kibuli Police headquarters for interrogation. Photo by Raymond Mayanja. The Mawokota South MP, John Bosco Lubyayi, notes that the rules had to be obeyed. He, however, adds that the manner in which it was handled could have been averted. “The way MPs were handled was uncalled for. It was improper for plain clothed security operatives to raid the House,” he said. Ajuri county MP Hanson Obua declined to comment, asking this reporter to consult with the men who raided the chamber. The Fort Portal Municipality MP Alex Ruhunda condemned the raid, referring to it as invasion of the sanctity, privilege and decorum of Parliament. He said the Speaker should have adjourned the House and barred access to Parliament. But Parliament’s Communications Director Chris Obore said interests of other people do not influence the Speaker’s action. “The Speaker does her job according to the rules of procedure of Parliament,” he stated. The Civil Society Organisations are asking President Museveni to condemn the manner in which security operatives raided Parliament yesterday. “Wednesday September 27, 2017 will go down in the history of our country as the day Ugandans made a choice between two critical and diametrically opposite pathways to our destiny as a country,” a statement reads. The NGO Forum also condemned in the strongest terms possible the brutal ‘defilement’ of Parliament that happened yesterday. “We condemn the brutal arrest of Members of Parliament and many activists, journalists and Ugandans that have expressed dissent about the proposed attempts to amend article 102 b of the Constitution to remove the age limit cap for the president,” NGO Forum states. The NGOs also called upon the private sector, traditional leaders, academia and business community, which have so far remained silent to come out strongly to condemn the negative trends in Uganda.